Vietnam was brought to us by the politicians who were not fit to rule a nation. Nothing has changed since our withdrawal from Vietnam as the North Vietnamese troops poured into Saigon in 1975. Yes. the Vietnam War was a total waste. There was no victory identified as such, other than the North Vietnamese wanted all foreign troops out of the whole of Vietnam. President Johnson could not understand why the enemy would not come to the peace table and “let us reason together”. But the North Vietnamese have been invaded a number of times in history and were victorious. They have a record of not giving up. The boys from Harvard, however, were the ones who weren’t bright enough to see this was a losing proposition. The Vietnamese soldiers didn’t go to Harvard. They were fighting for their country. Now they’re making Nike shoes for American stores. Watts. Los Angeles. National Guard units put down the rioting. In Detroit, 4,700 troops of the 82nd airborne helped bring order in 1967. As a result of the long war, millions of Vietnamese were killed and many were North Vietnamese troops (General Giap said 1 million North Vietnamese soldiers) and around 58,000 Americans. It wound up with American sailors and soldiers, black and white, fighting each other on ships and on the ground. 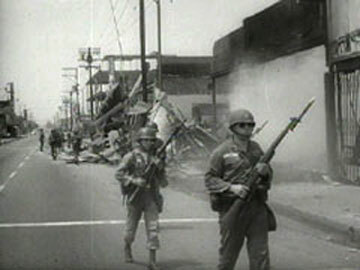 Back home cities were on fire and black American civilians clashed with National guards while regular soldiers assisted in American cities in the 60s and 70s. The only goal for an American soldier in battle overseas was to do whatever he could to survive. One motto was kill them all. Then we could go home. These videos show some of the pointless mayhem that finally ended in our withdrawal from the madness. For the soldiers on the ground, it would be the nightmare that never goes away. This music is part of the completely insane world that they inhabited. A war that no one wanted to take responsibility for. Soldiers who fought in the war will always remember the songs that were playing on the radio in the 60s and 70s. Many of the sounds remind them of times they would like to forget. For me, these are some on the playlist that bring back strong emotions each time I think of friends I lost from the 60s to the 70s. I have four short stories about Vietnam vets for your consideration. They were soldiers I knew, who are now dead or were never the same again. It’s obvious that our “leaders” still haven’t learned. It’s generally true that those who want to lead a nation are not qualified to serve. They have long ago sold their soul to those who pull the strings. The real leaders would never get elected. 1. Karl Jr. threw a softball like a girl “and batted like a girl, except the girls here could throw like a boy so when it came time to choose sides, Karl was the last one picked. And sometimes he didn’t get picked at all. One side would decide to play shorthanded. But no one mentioned it and Karl never got any better at it.” Then after graduating from high school, he joined the marines. It was 1966. 3. “Turner was maybe 5-9 and 145 pounds. But he always kept his demeanor except when someone told a good joke. Other times he would just look, shake his head and walk away. Turner, all by himself, kept the cigarette companies profitable.